I just turned 30 this year and I’ve always loved the Mario games. Mario is muh jam! Yoshi is my absolute favorite. 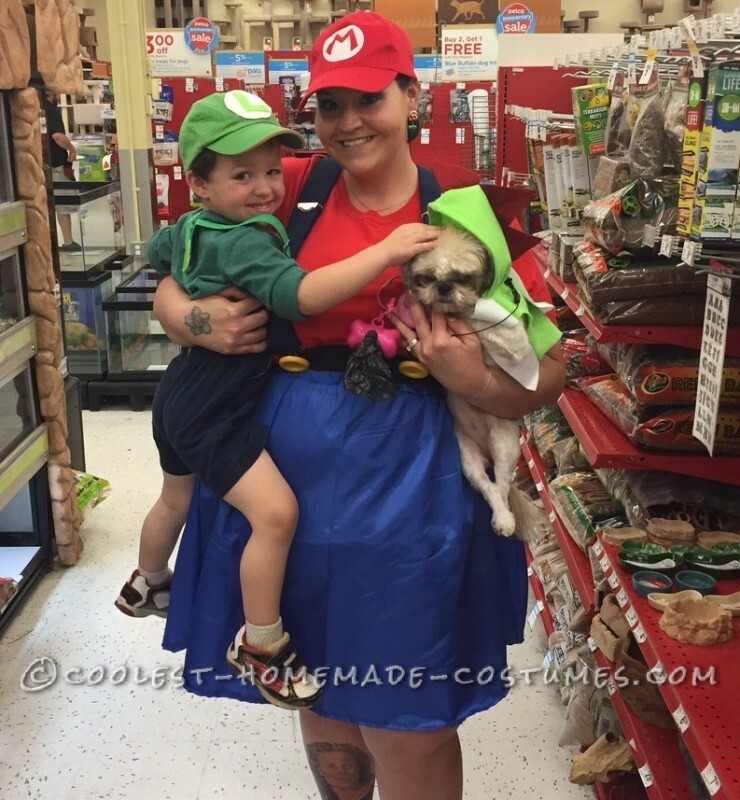 I wanted to dress my dog up as Yoshi so naturally I’d go as Mario (none of this wimpy Princess Peach stuff for me) and my son would don a Luigi costume. 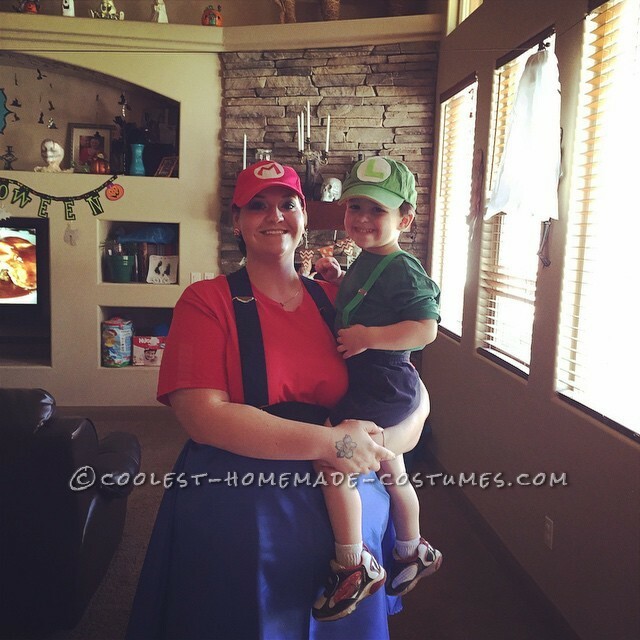 The husband is a party pooper and refused to let me make a Piranha plant costume for him. His loss I say! 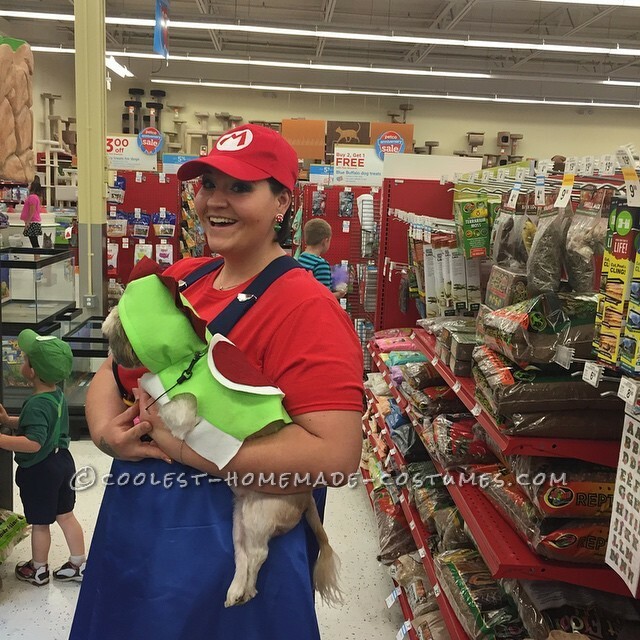 I’m a plus size gal and I, at the time, couldn’t find anything that would fit the Mario bill (I later found a site the sells them. boo hoo) and since I’m a crafty craft person I decided to make it myself. I knew it would be pretty simple so I got a skirt I like to wear and tried to copy it to my best ability onto some blue fabric, making clothes is not in my forte as a crafter though. It came out ok! I found the perfect buttons at my local craft store, bought the hat on eBay and paired it with some blue suspenders. My son’s costume was even simpler. I found a green hat and hot glued the famous L shape onto it, put him in a green shirt and suspenders, and he was off. My dog’s costume was more involved. All hand sewn and I basically had to guesstimate a bunch of stuff since there is no tutorial on making a Shih Tzu Yoshi costume. I think I was pretty successful on all fronts. My dog got second place in the dog costume contest. Losing out to some black dog in a store bought Alice in Wonderland costume (it was a blue dress with a blue bow. ), not that I’m bitter or anything, I’d only been planning the Yoshi costume since last October and went through hours of sewing, un-sewing, hot gluing and finagling to make that thing. Without further Ado. Homemade costume idea posted by Beverly W.